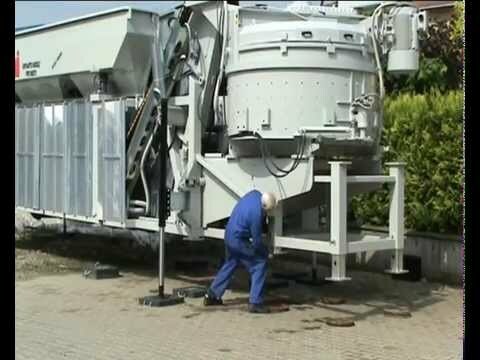 Mobile wet bin-fed batching plants are fitted with a self-installing mixer that does not require a crane for assembly. They can be up and running within just a few hours of arrival on site and requires only minimal staff for installation. The batching plant is capable of producing 50m3 of wet concrete per hour, making it ideal for suppliers of ready-mixed concrete and for large construction sites that require a fully homogenised mix. Compact, completely pre-wired and designed to be transported on a standard truck or can fit into a 40’ container. During transportation the mixer is an integral part of the plant; upon arrival on-site a specially designed hydraulic lifting system automatically raises the mixer into position. The same system also lifts the support frame and external platforms into place. The aggregate elevator belt is also pre-assembled and simply folds out into place from inside the hopper. The batching plant is managed via a colour touch-screen control panel, which uses a software system developed on a Windows platform enabling the user to create and store formulas, batching reports and dockets, and download the data so that it can be viewed on any computer.